Atypical house, amenities trends, very bright, garden raises. Property 75: Atypical house, amenities trends, very bright, garden raises. Property 83: Holiday villa 110 m², pool, in quiet village. Property 86: villa pool terrace garden near tourist area ideal budget. Property 92: A lovely holiday home near the Provencal towns of Nimes and Avignon. 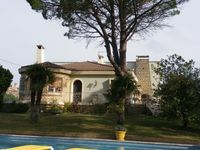 Villa with pool, 8 minutes from Avignon, fully equipped. Property 94: Villa with pool, 8 minutes from Avignon, fully equipped. Property 95: Provençal farmhouse in the Alpilles, swimming pool, luxurious services. Property 99: Rated 4 stars furnished house with garden & pool. We thank Mr and Mrs Portes for their warm welcome and total trust. They left us their house as they would have done it for friends. We had a great time by the swimming pool. The house had all the necessary comfort and the air conditioning was more than welcome given the heat during our stay there. We and the kids had a great vacation 👍. Haley Family. August 2018. We loved our stay at this house. I was concerned about it being remote, but it is right off of a main road about 7 minutes away from Ch&acirc;teaurenard, with access to grocery stores. It is about 20 minutes from Avignon, St. Remy, and 35 minutes from Arles. The lovely owner lives next door on the same lot with completely separate entrance.This house is great for large families or groups. The large pool was very refreshing and the pool table inside provided us with great family time. The only problem we had was that were out of wifi for most of our stay because of strong winds. We welcomed it as it allowed our teenage daughter to join us at the pool as well to play on the pool table.